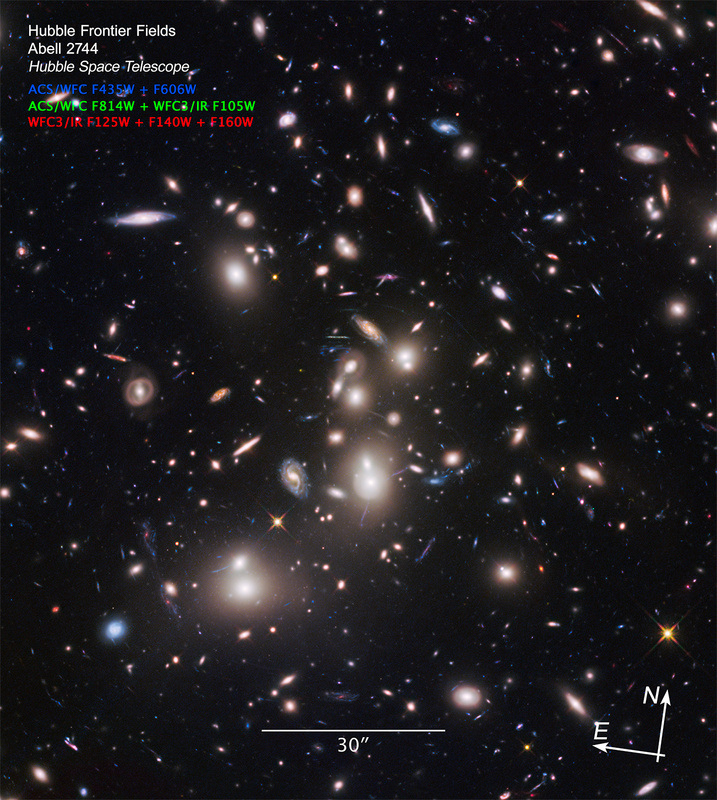 This past summer, the Hubble Frontier Fields team completed observations of the first cluster on its list: Abell 2744! The second set of observations — astronomers call them epochs — consisted of 70 orbits and marks the completion of the first Frontier Fields galaxy cluster. 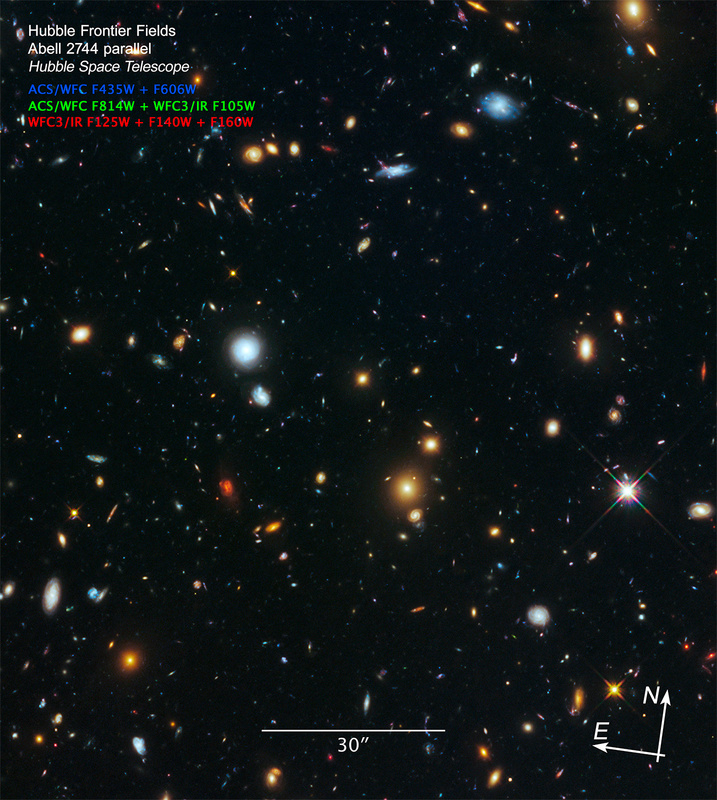 During this set, Hubble’s Advanced Camera for Surveys (ACS) was pointed at the main galaxy cluster and studied the visible-light portions of the spectrum, while the Wide Field Camera 3 (WFC3) looked at the parallel field in the infrared. Remember that Hubble will visit each field multiple times, with Hubble oriented such that one set of observations will point WFC3 at the cluster and ACS at a parallel field adjacent to the cluster (that’s one epoch). The telescope will then come back and do another set of observations with the cameras switched: ACS pointing at the cluster and WFC3 pointing to the parallel field (that’s the second one). 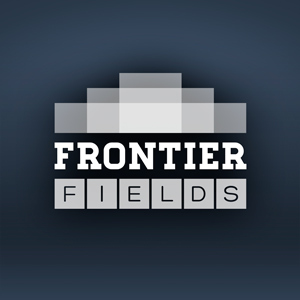 The Frontier Fields team does this to allow for complete wavelength coverage in both infrared and visible light for the galaxy cluster and the parallel field. The first epoch, completed in November 2013, consisted of 87 orbits. This brings the total amount of time Hubble looked at this cluster to 157 orbits. Final mosaic of the Frontier Fields galaxy cluster Abell 2744. This image is the culmination of both epochs totaling 157 Hubble orbits. The numbers prefixed with “F” are the Hubble filters used by the ACS and WFC3 cameras to take the image. The scale bar of 30″ is approximately 2% the angular size of the full moon as seen from Earth – very small! This is the completed composite mosaic of the Parallel Fields observed with galaxy cluster Abell 2744. See? Epic! Er, I mean epoch. Once the second epoch was completed, some of the faintest galaxies ever seen were measured for the first time. Astronomers have been working on these images since their release, and we are anxiously awaiting to hear what they find. ← What is Dark Energy? Reblogged this on Le Stelle (scienza ed astronomia per tutti) – The Stars (science and astronomy for everyone) – Las Estrellas (la ciencia y la astronomía para todos) . Thanks – Gracias – Grazie. Greetings from Rome – Saludos desde Roma – Saluti da Roma.